, Wicliff, de Wyclif, or Wiclef (John), a very learned English divine in the fourteenth century, and the first champion of that cause which was afterwards called Protestantism, was born at a village then called Wickliffe, from which he took his surname, near Richmond in Yorkshire, in 1324. Of the parents of one who lived in so remote a period, it cannot be expected that we should be able to procure any account. He was sent early to Oxford, and was first admitted commoner of Queen’s college, and afterwards of Merton, where he became probationer, but not fellow, as has been usually reported. While he resided here, he associated with some of the most learned men of the age who were members of that college, and it is said that Geoffry Chaucer was at one time his pupil. Among his contemporaries, he was soon distinguished both for study and genius. He acquired all the celebrity which a profound knowledge of the philosophy and divinity then in vogue could confer, and so excelled in wit and argument as to be esteemed more than human. Besides the learning of the schools, he accumulated a profound knowledge of the civil and canon law, and of the municipal laws of our own country, which have been rarely an object of attention until the establishment of the Vinerian professorship. He also not only studied and commented upon the sacred writings, but translated them into English, and wrote homilies on several parts of them; and to all this he added an intimate acquaintance with the fathers of the Latin church, with St. Austin and St. Jerome, St. Ambrose and St. Gregory. With these acquisitions, he did not hastily obtrude the novel opinions to which they had given rise. He was thirty-six years of age before his talents appeared to the world, and even then they were called forth rather by necessity than choice. In 1360 he became the advocate for | the university against the incroachments made by the mendicant friars, who had been very troublesome from their first establishment in Oxford in 1230, and had occasioned great inquietude to the chancellor and scholars, by infringing their statutes and privileges, and setting up an exempt jurisdiction. Their misconduct had decreased the number of students from thirty thousand to six thousand, parents being afraid to send their children to the university, where they were in danger of being enticed by these friars from the colleges into convents; and no regard was paid to the determination of parliament in 1366, that the friars should receive no scholar under the age of eighteen. But Wickliffe now distinguished himself against these usurpations, and, with Thoresby, Bolton, Hereford, and other colleagues, openly opposed the justification which the friars had advanced in favour of their begging trade from the example of Christ and his apostles. 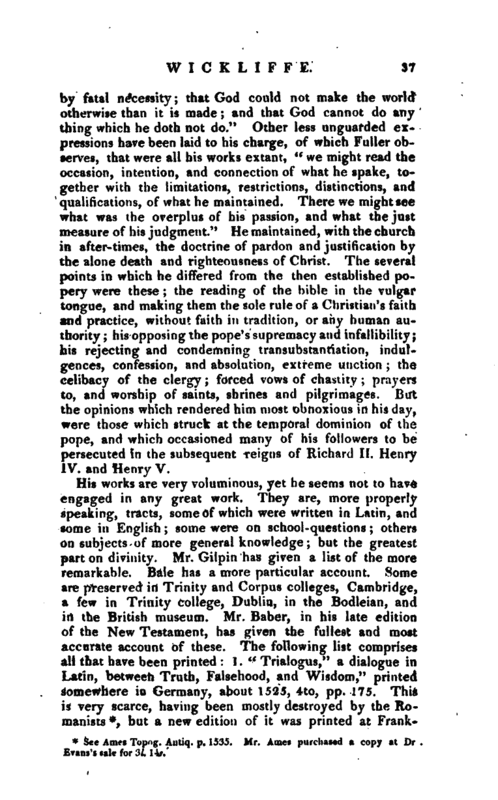 Wickliffe also wrote several tracts against them, particularly “Of Clerks Possessioners,” “Of the Poverty of Christ, against able Beggary,” and “Of Idleness in Beggary.” These were written, with an elegance uncommon in that age, in the English language, of which he may be considered as one of the first refiners, while his writings afford many curious specimens of old English orthography. His controversies gave him such reputation in the university, that, in 1361 he was advanced to be master of Baliol college; and four years after he was made warden of Canterbury-hall, founded by Simon de Islip, archbishop of Canterbury, in 1361, and now included in Christ-church. The letters of institution, by which the archbishop appointed him to this wardenship, were dated 14 Dec. 1365, and in them he is styled, “a person in whose fidelity, circumspection, and industry, his grace very much confided; and one on whom he had fixed his eyes for that place, on account of the honesty of his life, his laudable conversation, and knowledge of letters.” Wickliffe amply fulfilled these expectations, till the death of the archbishop in 1366, who was succeeded in che archiepiscopal dignity by Simon Langham. This prelate had been a monk, and being inclined to favour the religious against the seculars, was easily persuaded by the morrks of Canterbury to eject Wickliffe in 1367 from his wardenship, and the other seculars from their fellowships. He also issued out his mandate, requiring WicklifFe and all the scholars to yield obedience to Wodehall as their | warden. This Wodehall had actually been appointed warden by the founder, but he was at such variance with the secular scholars, that the archbishop was compelled to turn him and three other monks out of his new-founded hall, at which time he appointed Wickliffe to be warden, and three other seculars to be scholars. The scholars now, however, refused to yield obedience to Wodehall, as being contrary to the oath they had taken to the founder, and Langham, irritated at their obstinacy, sequestered the revenue, and took away the books, &c. belonging to the balL Wickliffe, and his expelled fellows, appealed to the pope, who issued a bull, dated at Viterbo 28 May, 1370, restoring Wodehall and the monks, and imposing perpetual silence on Wickliffe and his associates. As this bull was illegal, and interfered with the form of the licence of mortmain, the monks in 1372 screened themselves by procuring the royal pardon, and a confirmation of the papal sentence, for which they paid 200 marks, nearly 800l. of our money. 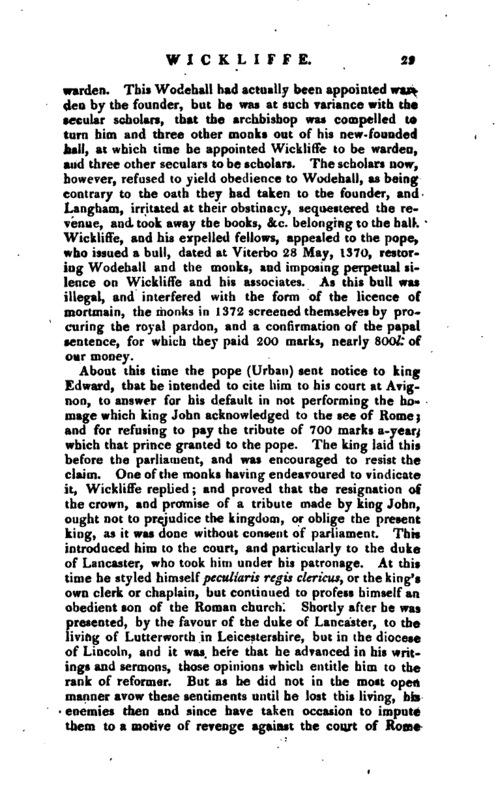 About this time the pope (Urban) sent notice to king Edward, that he intended to cite him to his court at Avignon, to answer for his default in not performing the homage which king John acknowledged to the see of Rome; and for refusing to pay the tribute of 700 marks a-year, which that prince granted to the pope. The king laid this before the parliament, and was encouraged to resist the claim. One of the monks having endeavoured to vindicate it, Wickliffe replied; and proved that the resignation of the crown, and promise of a tribute made by king John, ought not to prejudice the kingdom, or oblige the present king, as it was done without consent of parliament. This introduced him to the court, and particularly to the duke of Lancaster, who took him under his patronage. At this time he styled himself peculiaris regis clericus, or the king’s own clerk or chaplain, but continued to profess himself an obedient son of the Roman church. Shortly after he was presented, by the favour of the duke of Lancaster, to the living of Lutterworth in Leicestershire, but in the diocese of Lincoln, and it was here that he advanced in his writings and sermons, those opinions which entitle him to the rank of reformer. But as he did not in the most open manner avow these seaiiments until he lost this living, his enemies then and since have taken occasion to impute them to a motive of revenge against the court of Rome | which deprived him. This, however, is not strictly the truth, as he seems to have uttered and maintained some of his reforming opinions before he was turned out of the rectorship. This is evident from a tract entitled “Of the last age of the Church,” published in 1356, fourteen years before, in which he censures the popish exactions and usurpations. It must be allowed, however, that his boldness increased with his sufferings. In 1372 he took his degree as doctor of divinity, and read lectures with great applause, in which he more strongly opposed the follies and superstitions of the friars, exposed their corruptions, and detected their practices without fear or reserve. The conduct of the court of Rome in disposing of ecclesiastical benefices and dignities to Italians, Frenchmen, and other aliens, became so notorious and oppressive, that in 1374, the king issued out a commission for taking an exact survey of all the dignities and benefices throughout his dominions, which were in the hands of aliens. The number and value of them appeared enormous, and he determined to send seven ambassadors to require of the pope that he would not interfere with the reservation of benefices. He had tried a similar embassy the yea before, which procured only an evasive concession. On the present occasion Wickliffe was the second person nominated, and, with the other ambassadors, was met at Bruges by the pope’s nuncio, two bishops and a provost. This treaty continued two years, when it was concluded that the pope should desist from making use of reservations of benefices. But the very next year, the treaty was broken, and a long bill-was brought into parliament against the papal usurpations, as the cause of all the plagues, injuries, famine, and poverty of the realm. They remonstrated that the tax paid to the pope amounted to five times as much as the tax paid to the king; and that God had given his sheep to the pope to be pastured, not fleeced. 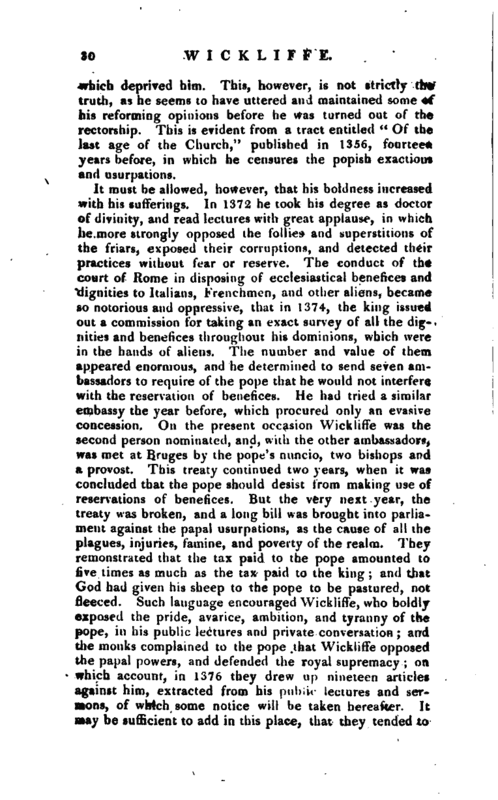 Such language encouraged Wickliffe, who boldly exposed the pride, avarice, ambition, and tyranny of the pope, in his public lectures and private conversation; and the monks complained to the pope that Wickliffe opposed the papal powers, and defended the royal supremacy; on which account, in 1376 they drew up nineteen articles against him, extracted from his public lectures ard sermons, of which some notice will be taken hereafter. It may be sufficient to add in this place, that they tended to | oppose the rights which the popes had assumed, and to justify the regal,‘ in opposition to the papal pretensions of an ecclesiastical liberty, or an exemption of the persons of the clergy, and the goods of the church from the civil power, in advancing such opinions, he had the people on his side, and another powerful protector appeared for him in Henry Percy, earl-marshal. This alarmed the court of Rome, and Gregory XL issued several bulls against Wickliffe, all dated May 22, 1377. One was directed to the archbishop of Canterbury and the bishop of London, whom he delegated to examine into the matter of the complaint; another was dispatched to the king himself, and a third to the university of Oxford. In the first, addressed to the two prelates, he tells them, “he was informed that Wickliffe had rashly proceeded to that detestable degree of madness, as not to be afraid to assert, and publicly preach, such propositions, as were erroneous and false, contrary to the faith, and threatening to subvert and weaken the estate of the whole church.” He therefore required them to cause Wickliffe to be apprehended and imprisoned by his authority; and to get his confession concerning his propositions and conclusions, which they were to transmit to Rome; as also whatever he should say or write, by way of introduction or proof. But, if Wickliffe could not be apprehended, they were directed to publish a citation for his personal appearance before the pope within three months. 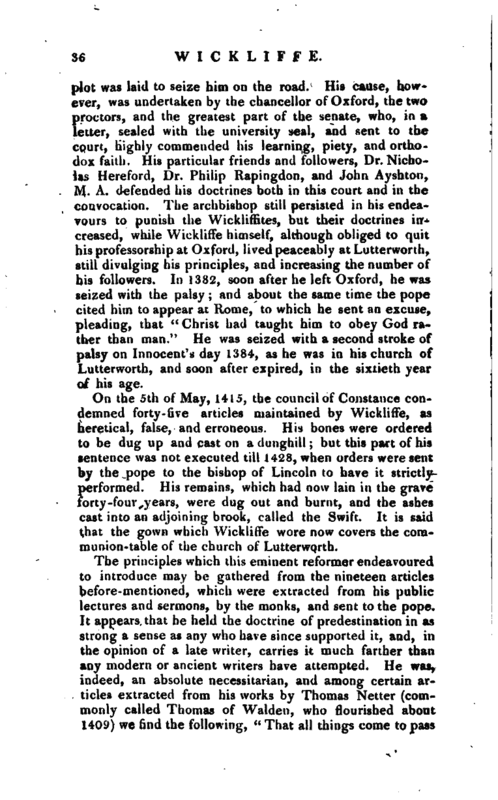 The pope requested the king to grant his patronage and assistance to the bishops in the prosecution of Wickliffe. In the bull to the university, he says, the heretical pravity of Wickliffe tended “to subvert the state of the whole church, and even the civil government.” And he orders them to deliver him up in safe custody to the delegates. King Edward III. died before these bulls arrived in England, and the university seemed inclined to pay very little respect to the one addressed to them. The duke of Lancaster and the earl-marshal openly declared they would not suffer, him to be imprisoned, and as yet, indeed, the bishops were not authorized by law to imprison heretics without the royal consent. The archbishop of Canterbury and the bishop of London, however, on the 19th Feb. 1378, issued out their mandate to the chancellor of the university of Oxford, commanding them to cite Wickliffe to appear before them in the church of St. Paul, London, within thirty days. But in such reputation was Wickliffe held at | this time, that when, in the interval before his appearance, the first parliament of king Richard II. 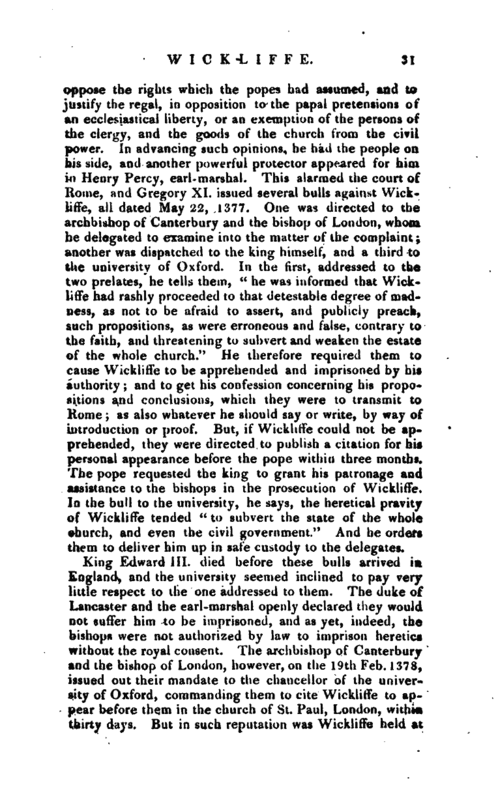 met, and debated “whether they might lawfully refuse to send the treasure out of the kingdom, after the pope required it on pain of censures, by virtue of the obedience due to him?” the resolution of this doubt was referred by the king and parliament to doctor Wickliffe, who undertook to prove the, legality of their refusal. Sueh confidence reposed in him by the higher powers augured ill for the success of the prelates who had summoned him to appear before them. On the day appointed, a vast concourse assembled, and Wickliffe entered, accompanied by the duke of Lancaster and the earl-marshal Percy, who administered every encouragement, to him. But before the proceedings began, an altercation was occasioned by the bishop oi London’s opposing a motion of the earl-marshal, that Wickliffe should be allowed a seat. The duke of Lancaster replied to the bishop in warm terms, and said, although rather softly, that “rather than -take such language from the bishop, he would drag him out of the church by the hair of his head.” But this being over-s heard, the citizens present took part with their bishop, and such a commotion ensued that the court broke up without entering on the examination, while Wickliffe was carried off by his friends in safety. The Londoners, in revenge, plundered the duke of Lancaster’s palace in the Savoy, and the duke turned the mayor and aldermen out of the magistracy for not restraining their violence. 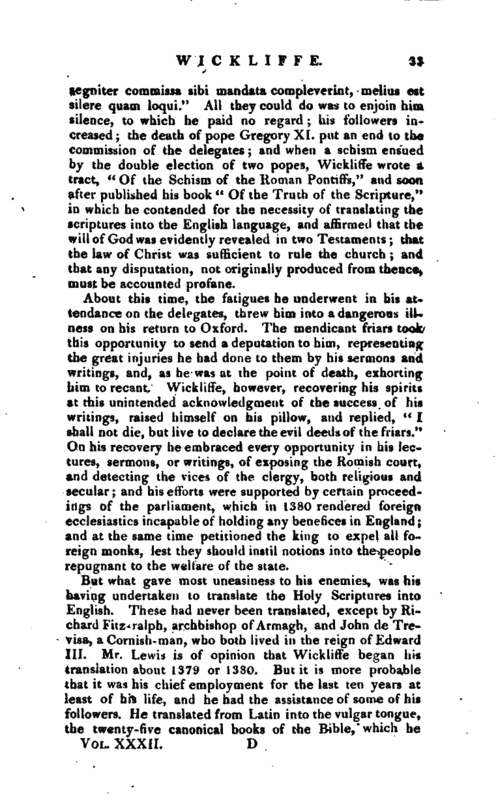 From these circumstances it would appear that at this time WicklihVs principles had not been espoused by many of the lower classes, as is generally the case with innovations in religious matters; yet it was not long before he had a strong party of adherents even among them, for when he was a second time cited by the prelates to appear before them at Lambeth, the Londoners forced themselves into the chapel to encourage him, and intimidate his judges and accusers, On this occasion Wickliffe delivered a paper to the court, in which he explained the charges against him, but the proceedings were again stopped by the king’s mother, who sent sir Lewis Clifford to forbid their proceeding to any definitive sentence against Wickliffe. This completely disconcerted them, and according to the evidence of their own historian, Walsyngham, changed their courage into pusillanimity. “Qui quam iodevote,” says he, “| quamsegniter commissa sibi mandata compleverint, inelius est silere quam loqui.” All they could do was to enjoin him silence, to which he paid no regard; his followers increased; the death of pope Gregory XI. put an end to the commission of the delegates; and when a schism ensued by the double election of two popes, Wickliffe wrote a tract, “Of the Schism of the Roman Pontiffs,” and soon after published his book “Of the Truth of the Scripture,’” in which he contended for the necessity of translating the scriptures into the English language, and affirmed that the will of God was evidently revealed in two Testaments; that the law of Christ was sufficient to rule the church; and that any disputation, not originally produced from thence, must be accounted profane. About this time, the fatigued he underwent in his attendance on the delegates, threw him into a dangerous illness on his return to Oxford. The mendicant friars took this opportunity to send a deputation to him, representing the great injuries he had done to them by his sermons and writings, and, as he was at the point of death; exhorting him to recant. Wickliffe, however, recovering his spirits at this unintended acknowledgment of the success of his writings, raised himself on his pillow, and replied, “I shall not die, but live to declare the evil deeds of the friars.” On his recovery he embraced every opportunity in his lectures, sermons, or writings, of exposing the Romish courts and detecting the vices of the clergy, both religious and secular; and his efforts were supported by certain proceedings of the parliament, which in 1380 rendered foreign ecclesiastics incapable of holding any benefices in England; and at the same time petitioned the king to expel all foreign monks, lest they should instil notions into the people repugnant to the welfare of the state. But what gave most uneasiness to his enemies, was his having undertaken to translate the Holy Scriptures into English. These had never been translated, except by Richard Fitz-ralph, archbishop of Armagh, and John de Trevisa, a Cornish-man, who both lived in the reign of Edward III. Mr. Lewis is of opinion that Wickliffe began his translation about 1379 or 1380. But it is more probable that it was his chief employment for the last ten years at least of his life, and he had the assistance of some of his followers. He translated from Latin into the vulgar tongue, the twenty-five canonical books of the Bible, which he | reckoned in the following order, and we transcribe as a specimen of the style and spelling of his language. “1. Genesis. 2. Exodus. 3. Levitici. 4. Numeri. 5. Deuteronomi. 6. Josue. 7. ludicum, that encloseth the story of Ruth, 8. 9. 10. 11. 12. 13. ben the 4 Bokes of Kyngand tweie Bokes of Paralipomenon. 14. Is Esdre, that comprehendeth Neemy. 15. Is Hester. 16. Is Job. 17. Psalter. 18. 19. 20, ben the 3 Bokes of Solomon. 21.22.23. 24, ben the four great prophets. 25. Is a Boke of 12 small Prophets, Osee, Joel, Amos, Abdie, Jonas, Michee, Nahum, Abacuc, Sophonie, Aggie, Zacharie, and Malachie.” He adds, “That whatever boke is in the Olde Testament without these 25 aforesaid, shal be set among Apocrypha, that is, withouten autoritie of belive. Therefore as holie chirch redith Judith and Tobit, and the Bokes of Machabeis but receiveth not thos amonge holi scriptures; so the chirch redith these 2 Bokes Ecclesiastici, and Sapieme to edifying of the people, not to confirme the autoritie of techyng of holi chirch. And that therefore he translated not the 3 ne 4 Boke of Esdree that ben Apocrypha.” The books of the New Testament he reckons in this order. 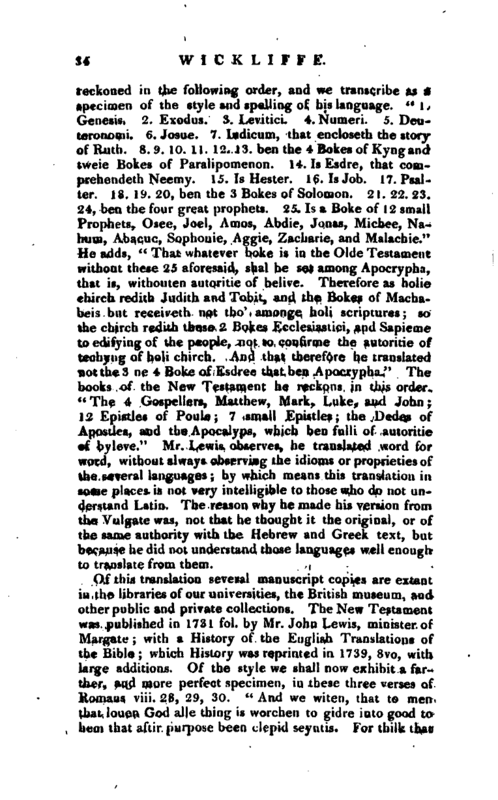 “The 4 Gospellers, Matthew, Mark, Luke, and John; 12 Epistles of Poule; 7 small Epistles; the Dedes of Apostles, and the Apocalyps, which ben fulli of autoritie of byleve.” Mr. Lewis observes, he translated word for word, without always observing the idioms or proprieties of the several languages; by which means this translation in some places is not very intelligible to those who do not understand Latin. The reason why he made his version from the Vulgate was, not that he thought it the original, or of the same authority with the Hebrew and Greek text, but because he did not understand those languages well enough to translate from them. In 1381 we find Wickliffe attacking the doctrine of transubstantiation, which was first asserted by Radbertus about the year 820, and had been always propagated by the Romish church. 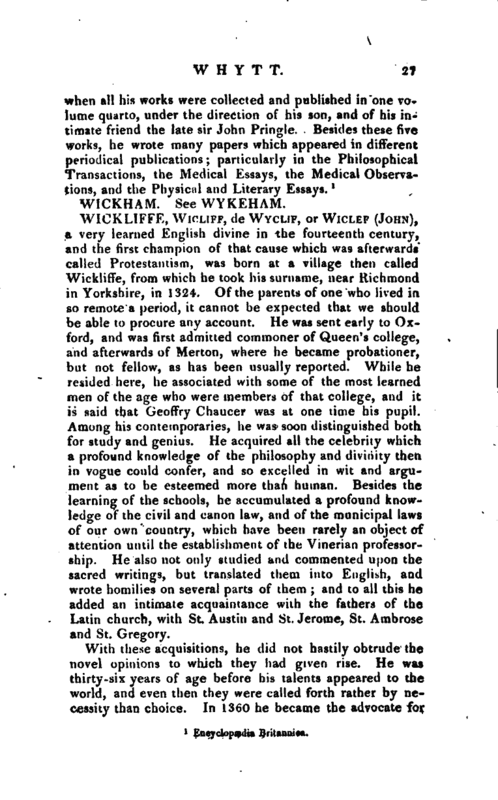 Wickliffe offered to support his opinion in a public disputation, but as that was prohibited, he published it in a tract entitled “De Blasphemia,” which was condemned by William de Barton, chancellor of the university, and eleven doctors, of whom eight were of the religious. 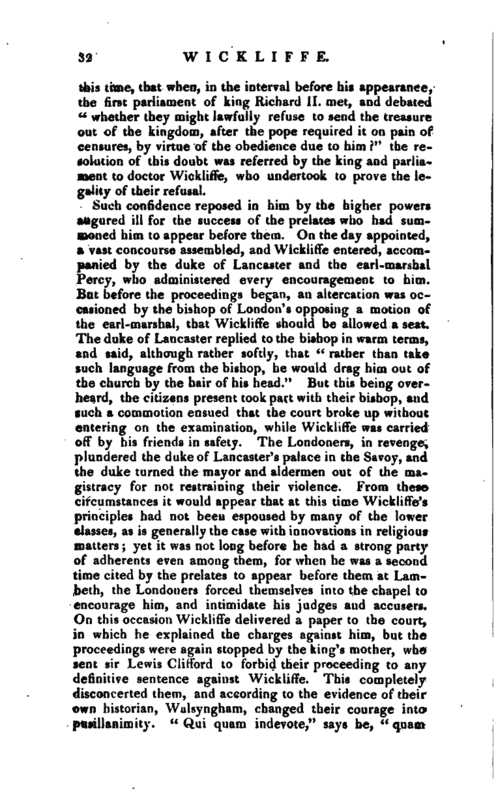 Wickliffe maintained that they had not refuted his assertions, and appealed from their condemnation, to the king. In the mean time William Courtney, bishop of London, succeeded archbishop Sudbury in the see of Canterbury, and was entirely devoted to the interest of his patron the pope. This prelate had before shewn himself a violent opposer of Wickliffe, and now proceeded against him and his followers. But as soon as the parliament met in 1382, Wickliffe presented his appeal to the king and both houses. Walsingham represents this as done with a design to draw the nobility into erroneous opinions, and that it was disapproved by the Duke of Lancaster, who ordered Wickliffe to speak no more of that matter. 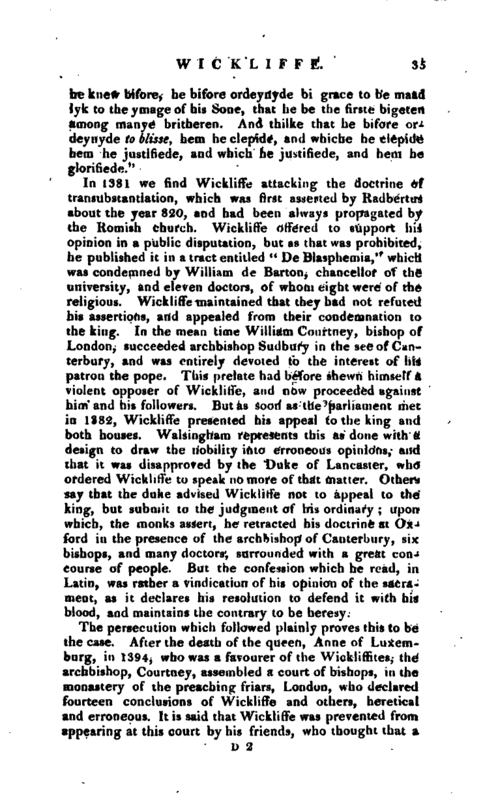 Others say that the duke advised Wickliffe not to appeal to the king, but submit to the judgment of his ordinary upon which, the monks assert, he retracted his doctrine at Oxford in the presence of the archbishop of Canterbury, six bishops, and many doctors, surrounded with a great concourse of people. But the confession which he read, in Latin, was rather a vindication of his opinion of the sacrament, as it declares his resolution to defend it with his blood, and maintains the contrary to be heresy. The persecution which followed plainly proves this to be the case. After the death of the queen, Anne of Luxemburg, in 1394, who was a favourer of the Wickiffites, the archbishop, Courtney, assembled a court of bishops, in the monastery of the preaching friars, London, who declared fourteen conclusions of Wickliffe and others, heretical and erroneous. It is said that Wickliffe was prevented from appearing at this court by his friends, who thought that a | plot was laid to seize him on the road. His cause, however, was undertaken by the chancellor of Oxford, the two proctors, and the greatest part of the senate, who, in a letter, sealed with the university seal, and sent to the court, highly commended his learning, piety, and orthodox faith. His particular friends and followers, Dr. Nicholas Hereford, Dr. Philip Rapingdon, and John Ayshton, M. A. defended his doctrines both in this court and in the convocation. 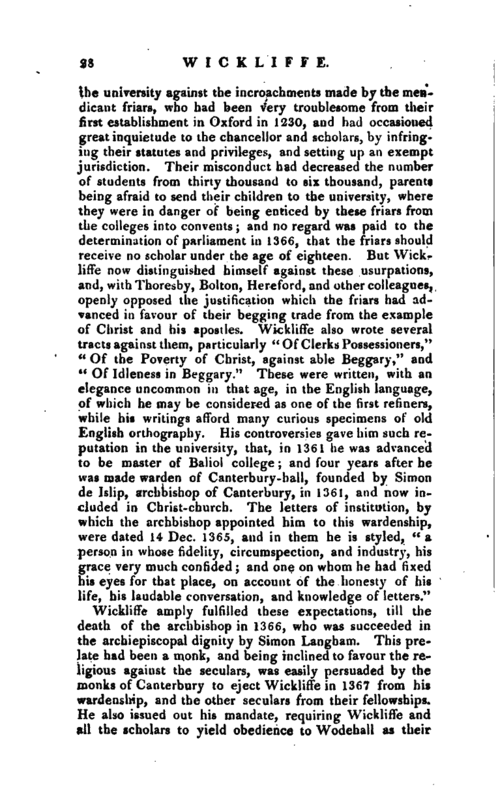 The archbishop still persisted in his endeavours to punish the Wickliffites, but their doctrines increased, while Wickliffe himself, although obliged to quit his professorship at Oxford, lived peaceably at Lutterworth, still divulging his principles, and increasing the number of his followers. In 1382, soon after he left Oxford, he was seized with the palsy; and about the same time the pope cited him to appear at Rome, to which he sent an excuse, pleading, that “Christ had taught him to obey God rather than man.” He was seized with a second stroke of palsy on Innocent’s day 1384, as he was in his church of Lutterworth, and soon after expired, in the sixtieth year of his age. On the 5th of May, 1415, the council of Constance condemned forty-five articles maintained by Wickliffe, as heretical, false, and erroneous. His bones were ordered to be dug up and cast on a dunghill; but this part of his sentence was not executed till 1428, when orders were sent by the pope to the bishop of Lincoln to have it strictly performed. His remains, which had now lain in the grave forty-four years, were dug out and burnt, and the ashes cast into an adjoining brook, called the Swift. It is said that the gown which Wickliffe wore now covers the communion-table of the church of Lutterworth. The principles which this eminent reformer endeavoured to introduce may be gathered from the nineteen articles before-mentioned, which were extracted from his public lectures and sermons, by the monks, and sent to the pope. It appears that he held the doctrine of predestination in as strong a sense as any who have since supported it, and, in the opinion of a late writer, carries it much farther than any modern or ancient writers have attempted. He was, indeed, an absolute necessitarian, and among certain articles extracted from his works by Thomas Netter (commonly called Thomas of Walden, who flourished about 1409) we find the following, “That all things come to pass | by fatal necessity; that God could not make the world otherwise than it is made; and that God cannot do any thing which he doth not do.” Other less unguarded expressions have been laid to his charge, of which Fuller observes, that were all his works extant, “we might read the occasion, intention, and connection of what he spake, together with the limitations, restrictions, distinctions, and qualifications, of what he maintained. There we might see what was the overplus of his passion, and what the just measure of his judgment.” He maintained, with the church in after-times, the doctrine of pardon and justification by the alone death and righteousness of Christ. The several points in which he differed from the then established popery were these; the reading of the bible in the vulgar tongue, and making them the sole rule of a Christian’s faith and practice, without faith in tradition, or any human authority; his opposing the pope’s supremacy and infallibility; his rejecting and condemning transubstantiation, indulgences, confession, and absolution, extreme unction; the celibacy of the clergy; forced vows of chastity; prayers to, and worship of saints, shrines and pilgrimages. But the opinions which rendered him most obnoxious in his day, were those which struck at the temporal dominion of the pope, and which occasioned many of his followers to be persecuted in the subsequent reigns of Richard II. Henry IV. and Henry V.
See Ames Topog. Antiq, p. 1535. Mr. Ames purchased a copy at Dr Evans’s sale for 3l. 14s. but a new edition of it was printed at | Frankfort, 1733, 4to. 2.” Wicklif’s Wicket, or, a learned and godly treatise of the Sacrament,“Norimberg, 1546, 8vo, and Oxford, 1612, 4to. 3.” The pathway to perfect knowledge, or Wickliffe’s Prologue to the Bible,“published by Robert Crowley, 1550, 12mo. 4.” The dore of the Holy Scripture,“1540, 8vo. 5.” De Christianorum villicatione,“in English, published in 1582, under the name of R. Wimbledon. 6.” A Complaint of John Wickliffe, exhibited to the king and parliament.“7.” A Treatise of John Wickliffe against the order of Friars.“These two were published together at Oxford in 1608, 4to, by Dr. James, from two ms copies, one in Bene’t college, Cambridge, the other in the Bodleian library. 8.” Why poor Priests have no Benefices,“published by Mr. Lewis in his life of Wickliffe, Who has also published there, his Determination, Confessions, and large extracts from his works remaining in ms. together with his New Testament. His opinions are also particularly detailed in Dr, Thomas James’s” Apologie for John Wickliffe, shewing his conformitie with the pew Church of England;" collected chiefly out of his ms works in the Bodleian library, and printed at Oxford, 1608, 4to, now very scarce. 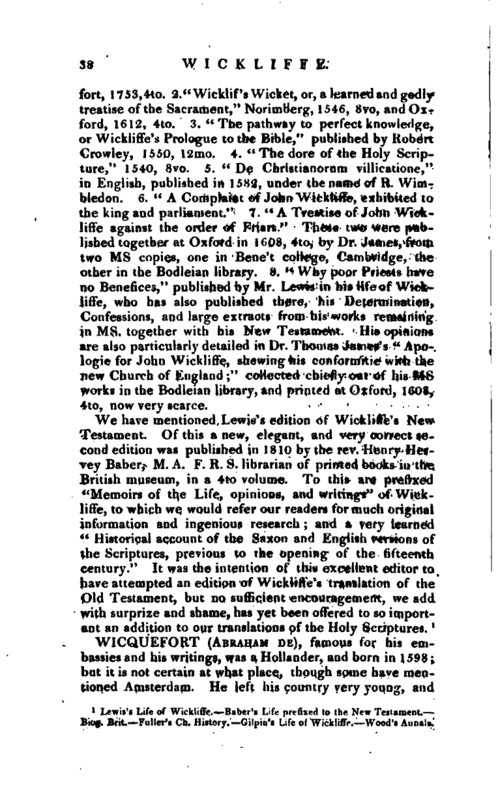 Lewis’s Life of Wickliffe.—Baber’s Life prefixed to the New Testament.— Biog. Brit.—Fuller’s Ch. History.—Gilpin’s Life of Wickliffe,—Wood’s Annals.